Mirasol is a beekeeper, a honey-gatherer, with an ability to speak to the earthlines, the sentient parts of Willowlands, where she lives. The concerns of Master, Chalice, and Circle, who govern Willowlands, have nothing to do with her until the current Master and Chalice die in a fire and leave no heirs to take their places. The Master’s closest relative has been a priest of Fire for the past seven years; he is not quite human anymore. And then the Circle comes to Marisol and tells her that she is the new Chalice, and it will be up to her to bind the land and its people with a Master. As the newly appointed Chalice, Mirasol is the most important member of the Master's Circle. It is her duty to bind the Circle, the land and its people together with their new Master. But the new Master of Willowlands is a Priest of Fire, only drawn back into the human world by the sudden death of his brother. No one knows if it is even possible for him to live amongst his people. Mirasol wants the Master to have his chance, but her only training is as a beekeeper. How can she help settle their demesne during these troubled times and bind it to a Priest of Fire, the touch of whose hand can burn human flesh to the bone? I had purchased Chalice ages ago, seeing it in Barnes and Noble and being intrigued by the cover. But for some reason I didn’t pick it up for the longest time. And then finally, one day, I decided to read it, and I really liked it. Chalice, at first, didn’t make much sense to me. I was trying to figure out what was going on, and how the whole world worked. The concept of Mirasol being the Chalice was a little fuzzy to me, and I’m not quite sure I ever understood it, but it was easy enough to look past that. I really loved the whole concept, the atmosphere, the writing, the cover… well, basically everything. This was genuinely just a good book. I don’t come across books like this often. My favorite characters? THE BEES. They were just awesome in a weird way. I have no idea why I like them so much, I just do. I mean, really, huge bees the size of your fist that make the world’s best honey and just buzz around all day? COOLNESS. Bzzzzz. I give this novel 4 out of 5 stars. I'm really glad you liked the book, it's on my to-read list. And the romance not being overly in your face for a change is nice. I'm glad you liked this! 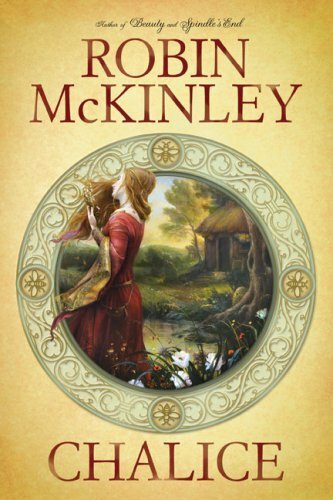 I have yet to read a Robin McKinley book (which is pathetic, since I call myself a fantasy fan), but I've heard great things about her. Romance that isn't the main focus of the plot is awesome. I really loved this book as well! It felt like an old favorite while I was reading it, even though it was my first time through!